Grace started using her right arm and reaching out towards a hanging object while in her swing today. She is batting at objects with both arms! She was just starting to do this before all of this started. Part of the loss of this skill was most likely do to a set back from the seizures and the other from the medication she is on. Now if she would only smile. 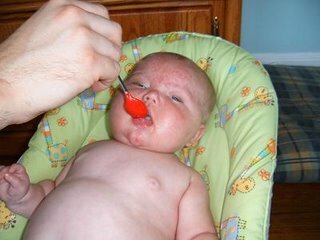 Today we drop Grace’s ACTH down to .25ml the original dosage we started her at. We are also going to decrease the clonzapam, as her head and body control are getting significantly worse, the clonzapam is a muscle relaxer so we are hoping that this help. We went back to the pediatrician’s office today, this time to meet with our regular pediatrician. We seemed to get things worked out and more of a straight answer as to what was going on with the diagnosis of Grace having thrush and then not having thrush. It was a relief to speak to Dr. Fornoff; we tried to assure him that we were not trying to be difficult it’s just really tough when two doctors are angry at each other and we are getting thrown around between them. We just want the best care for her and we can’t seem to do that when ego’s get in the way. It’s not like we enjoy spending half of our awake time in various doctor offices or hospitals. Today we had Grace’s Occupational Therapy. We are trying to develop the use of her right side, she greatly prefers her left side. We are working on things like rolling over and gripping objects. Grace was starting to grasp objects before all of this started but she has lost the ability. Right now at almost six months she she around the development of a two and a half month old. We have been working on things for the past few weeks. We started to see some significant changes in the last couple days she is starting to tract objects much better and grabbing a hold of light objects. She even rolled over today to her back, granted she was a little annoyed to be on her front so that probably helped. We tried to feed Grace some rice cereal with a spoon, she did really well for our first attempt. 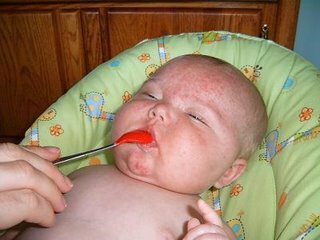 We need to get her eating by a spoon because if the drug Keppra she is on does not work we will be switching to Topamax which comes in little sprinkles that we will need to feed her on top of applesauce or rice cereal.